The actual state of our knowledge is always provisional and … there must be, beyond what is actually known, immense new regions to discover. 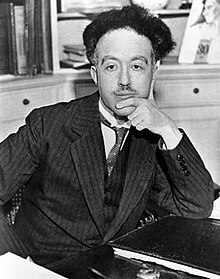 Louis de Broglie (15 August 1892 – 19 March 1987) was a French physicist became a Nobel laureate in 1929 for his theory on wave–particle duality. La nouvelle dynamique des quanta (1928), translation by Bacciagaluppi, G., Valentini, A. (2009). Quantum Theory at the Crossroads: Reconsidering the 1927 Solvay Conference. Cambridge University Press. p. 380. ISBN 0521814219. Will Quantum Physics Remain Indeterministic, in Louis de Broglie (1953). The revolution in physics: a non-mathematical survey of quanta. Noonday Press. p. 237. Two seemingly incompatible conceptions can each represent an aspect of the truth … They may serve in turn to represent the facts without ever entering into direct conflict. Dialectica, Vol. 2, No. 3/4 (1948), p. 326. Foreword of book by David Bohm (1984). Causality and Chance in Modern Physics. Routledge. p. x. ISBN 0415174406. 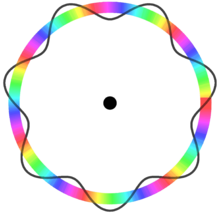 Admettant que la particule possède une vibration interne qui permet de l'assimiler à une petite horloge, je supposais que cette horloge se déplaçait dans son onde de façon que sa vibration interne reste constamment en phase avec celle de l'onde : c'est le postulat de l'accord des phases. Assuming that the particle has an internal vibration which allows to assimilate it to a small clock, I supposed that the clock was traveling with the wave in such a way that its internal vibration remained constantly in phase with the wave's : this is the phase matching postulate. Sur les véritables idées de base de la mécanique ondulatoire, Louis de Broglie, C. R. Acad. Sci., 277, série B, 1973, p. 71-73. This page was last edited on 31 March 2019, at 11:51.